The chart above shows a great deal of optimism for Pandora, the internet radio giant. The company has once again defied the skeptics that prognosticate its demise with nearly every move in the digital music. Let’s face it, there’ve been several “Pandora Killers” that have come and gone, and none has slowed the company’s momentum. And now even Goldman Sacks is a believer. Analyst Heath Terry said the company’s shares can top $60 if it achieve some of its bigger business goals. Ouch! Not quite the coverage Pandora wanted? Which makes the troubles the company encountered with rights holders even more strange. 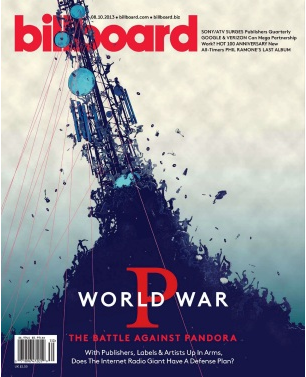 As it has been reported to death, Pandora has run into a buzzsaw of awful PR as it has tried to keep its royalty rates low. First the company sponsored legislation to lower its costs paid for sound recordings. The Internet Radio Fairness Act was designed to lower the cost of those royalties to the level that broadcasters and satellite radio operators pay. When legislation stalled the company attempted to purchase a small radio station in South Dakota so that they would qualify for the lower broadcaster rate. Neither of these efforts created anything but ill will. Pandora *does* pay much more in royalty costs than broadcast or satellite, and that doesn’t seem quite fair. But there is a process available for recourse during their next negotiation. The problem is that Pandora does pays significantly less in publishing costs than many other services (more than half the 10% of revenue streaming services pay). And while the company is correct in stating that they do pay a significant portion of their revenue overall to all rightholders, their offensive on songwriters and composers just seems bizarre. Pandora has a much more to do to grow the business. It must sell many more local ads. The service still isn’t readily available in a majority of cars like Sirius/XM. It still needs to convert a huge portion of broadcast radio listeners to using the service. With all these goals, why would the company go directly against songwriters, especially since Pandora founder Tim Westergren talks about how he’s an artist himself? It has led to hard feelings, despite signing direct deals with the major publishing companies after all legal hopes were extinguished. Pandora, like all companies in digital music, have two stakeholders they must keep happy: customers who use the product and rightsholders who supply the content. Walmart can squeeze the suppliers for every dime and face little blowback. But the company must convince those people who create music that Pandora streams are good for their careers, which becomes challenging when you involve lawyers and lobbyists.